Kancha Ilaiah has the right to freedom of expression. 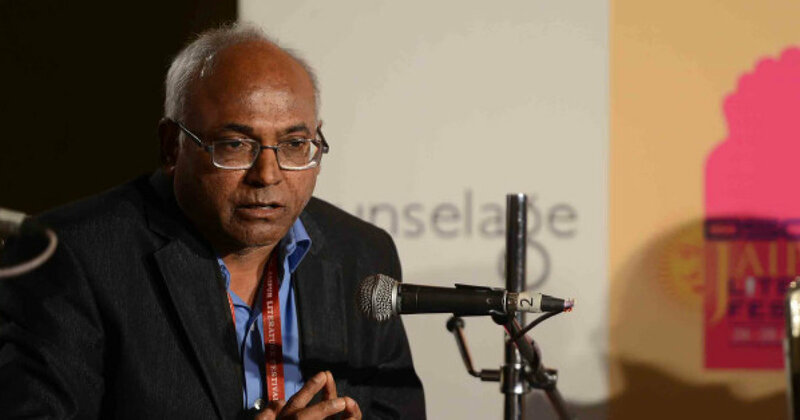 Kancha Ilaiah Shepherd has emerged as the most prominent antagonist of the Hindutva forces in the country. Ilaiah, a political science professor, came into the limelight with his book “Why I Am Not a Hindu” and he has relentlessly been attacking anything and everything related to Hindu ever since. His latest book titled ‘Samajika Smuglarlu Komatollu’ has stirred the ‘Arya Vaishya’ community in the Telugu speaking states. Though I haven’t read the book, I came to know that it critically scrutinizes the role played by “Arya Vaishyas” in the society. Vaishyas, a dominant caste and the third in the hierarchy of Hindu caste system, are a predominantly trading community and control a large part of the wholesale and retail trade, especially the essential commodities. Ilaiah alleges that the Vaishyas, who rarely produce anything, don’t make any positive contribution to society, and therefore the society can survive even without their presence. So Ilaiah, through his writings, wants to highlight the lack of positive contribution to society from certain castes. It is a fact that in the Hindu society there are some castes which led a kind of parasitic lives for generations. Take the example of Brahmins. They were hardly involved in any productive activity and in fact, the role played by them is to a great extent negative. They, for generations, misled the society in the name of religion, introduced meaningless rituals, promoted superstitious beliefs and played a lead role in perpetuating caste discrimination. In an essence, they exploited the inherent sense of insecurity among the people to run their God business, which is a classic example of non-economic activity. Many Brahmins say that they were involved in spreading knowledge. But the question arises whether they have spread that knowledge among all the sections of society? They taught only Brahmins and Kshatriyas and made sure that they don’t impart any knowledge to Sudras and Dalits. Being a community of shopkeepers, Vaishyas ran most of the wholesale and retail outlets in both urban and rural areas and their activities can’t be labeled as non-economic activities. However, even now people associate Vaishyas with excessive profiteering, usury and stashing of wealth. Therefore, they also played a largely negative role in the impoverished Indian society. Even the other dominant castes such as Kamma and Reddy, who own disproportionately large tracts or land, have the history of perpetrating atrocities against Dalits. The massacres against Dalits in villages such as Neerukonda, Padirikuppam, Kanchikacharla, Karamchedu and Tsunduru are the testimony to the upper caster cruelty and arrogance. The main intention of Ilaiah appears to be to attack the dominant castes in Hindu society and expose the negative role played by them. There is nothing wrong in questioning the discriminatory, exploitative and hegemonistic practices prevalent in the Hindu society. The Vaishyas, however, appear to have taken offense to Ilaiah’s writings and started a concerted campaign against him. They even accuse him of trying to promote Christianity. If there is anybody who is promoting Christianity in a big way in India, it is the Hindu clergy and the caste Hindus. The clergy hardly mingles with Dalits and don’t hide their Brahmin bias. The caste Hindus are known for their discrimination and mistreatment of Dalits. It is a fact that Dalits are not in a position to lead a life of self-esteem as long as they are in Hindu fold. The caste system is so rigid that even after a Dalit converts to Christianity he is not treated on par with other Christians. A Brahmin Christian or a Reddy Christian looks down upon his Dalit Christian counterpart. The Hindu caste system is such that it does not even allow the Dalits to stay united. For example, in the Telugu speaking states of Andhra Pradesh and Telangana, there is a feud between Mala and Madiga communities on the issue of sharing the fruits of reservation. In spite of all these anomalies why caste system is still strong? As Dr. B. R. Ambedkar had rightly observed, the characteristic of graded inequality prevalent in Hinduism keeps caste system ticking in Hindu society. Except Dalits, all Hindu castes have someone or the other under them, whom they consider inferior to them, and therefore worthy of exploitation. The fact of the matter is the caste system in Hinduism is a sinister arrangement, which is bent on dehumanizing Sudras and Dalits. The Swamijis and Hindutva organizations are only interests in perpetuating the evil system. Therefore, it becomes inevitable for the intellectuals to criticize the caste system and along with it the upper caste people, who perpetrated untold atrocities against Dalits. The thing all the caste Hindus must understand is tribals, Dalits, and other backward caste people have a right to question the inherently inequitable and exploitative caste system and raise some pertinent issues with regard to the current status of the suppressed classes. Therefore, it is wrong on the part of the caste Hindus to issue death threats against the writers with an intention to suppress their freedom of expression. The Supreme Court has rightly refused to impose a ban on the book, and therefore upheld the freedom of expression. The need of the hour, if Hinduism has to survive, is to introduce sweeping reforms in the Hindu way of life, especially destroying the caste system entirely to bring about equality and unity among all Hindus. Nothing less than a complete annihilation of caste and unequivocal condemnation of Brahminism will save Hinduism from complete extinction. Many people opine that Hinduism survived for millenniums and it will definitely survive for eternity. But that is not true. In this 21st century, equality is non-negotiable. If they have any doubts they can visit a Dalit hamlet and count the number of Hindus who haven’t yet converted to Christianity. This entry was posted in Society and tagged caste system, freedom of expression, Hinduism, Kancha Ilaiah on October 24, 2017 by Dr. Ramachandra Reddy.